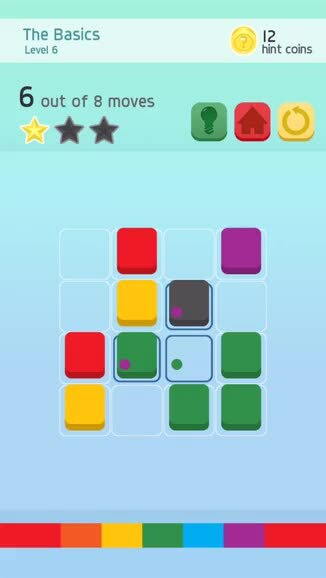 Spectrum 6 ($1.99) by Marc Joel Jamero is a puzzle game that’s all about mixing up colors and getting them to their right place. If you enjoyed games like Threes! 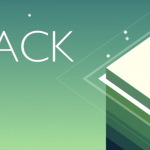 and Blyss, but don’t mind getting a little messy with the color spectrum, then you will enjoy Spectrum 6, as it’s a puzzle game that offers up a refreshing new gameplay mechanic. I’ve played plenty of games during my time around here, but one thing continues to hold true: my favorites continue to be puzzle games. Because after a long, busy day, I just need to unwind with a game that doesn’t stress me out too much while still providing a challenge to keep my mind busy. A lot of puzzle games have come and gone, but I’m still down to check out anything that seems interesting, and Spectrum 6 passed the bill as I was browsing the App Store. I’m no artist, but I love color, so the gameplay mechanic caught my attention immediately. 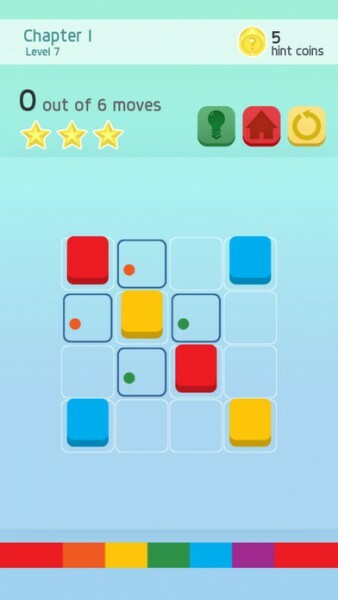 Needless to say, if you’re looking for a challenging puzzle game, then you shouldn’t miss this one. Visually, Spectrum 6 has a nice and clean aesthetic that is rather pleasing to the eyes. The backdrops feature tranquil color gradients that help with putting your mind at ease, and the tiles are nice and crisp, even featuring a bit of depth to them. 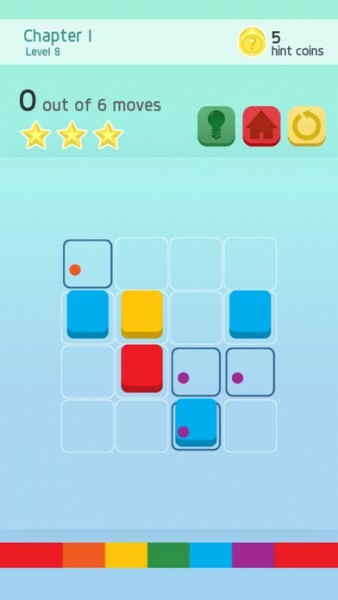 In fact, it is definitely reminiscent of Threes!, but that’s not an entirely bad thing, especially considering how the gameplay is so different. The game features bright and vibrant colors (which is only fitting), the typography is easy-to-read, and the icons are easily recognizable. The animations in the game are smooth and fluid, and it’s always fun to watch the colors get mixed together and transition into a new shade. Unfortunately, the game’s ambient soundtrack only plays while you’re browsing the level select screen, but doesn’t play as you are solving the puzzles. This may satisfy some who prefer to listen to their own music as they play games, but I believe it should be made an option. At least the sound effects during gameplay are bubbly and fun. At the moment, Spectrum 6 contains 63 levels that are spread out across nine different chapters, and there are tutorial stages that show you the ropes. The goal of each stage is to mix the colors properly and assign colors to specific spots on the grid, as you can tell by the dot color on the spaces. While it sounds easy enough, you’ll have to know which primary colors (red, yellow, and blue) are needed to make secondary colors (orange, green, and violet), and get them to their correct spots without tainting other colors along the way. For those who are a bit lost with primary and secondary colors, there is a handy reference bar at the bottom of the screen. 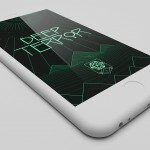 Controls in Spectrum 6 are easy enough to understand, but mastering them is the tricky part. Just tap on a color square to have it split up and fill the four adjacent spaces around it (unless it’s on the edge). To mix two primary colors, just have them both land in the same square. Once a secondary color has been made, you can move it around just as if it were a primary color as well. If you mix all of the primary colors together, you’ll end up with black. 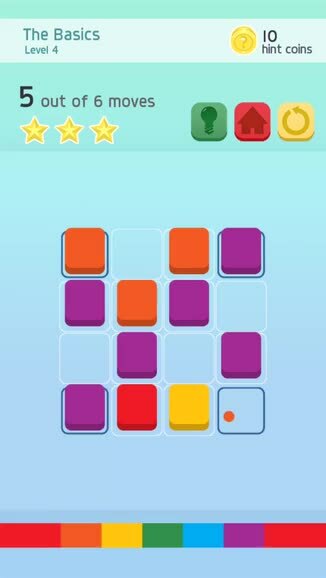 When all of the required colors are in their proper spot, you’ll have cleared the level and can move on to the next. 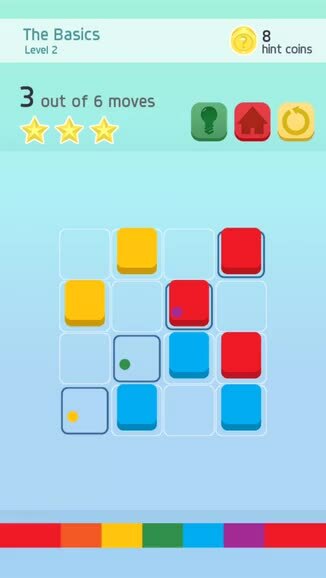 The number in the top left corner of the screen tells you how many moves you’ve taken, as well as the fewest moves in which the puzzle can be solved in. 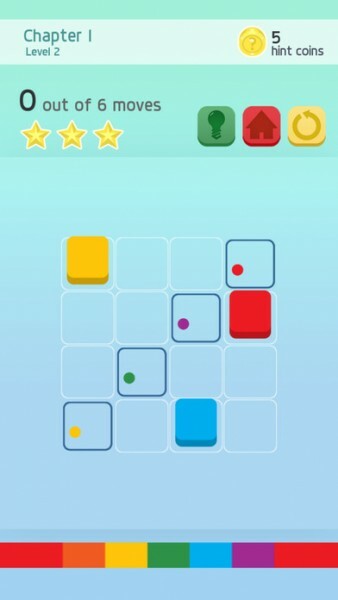 You’ll get a “perfect” and three stars if you solve it in the fewest moves possible, but if you end up with more moves, you’ll lose a star or two, depending on how you do. While the game sounds easy from the start, it requires a lot of strategy and planning ahead to master. And because you have to understand what colors combine into what, Spectrum 6 is a true brain teaser at times. If you make a mistake, you can easily restart the stage with the button at the top. However, I did find the lack of an “undo” button rather annoying, because sometimes I just needed to go back one move to fix my mistake, rather than start over entirely. Hopefully the developer can add an “undo” option in a future update. If you get stuck, the game does provide you with hints. It will cost you some hint coins to activate a hint, but you’ll earn more coins as you successfully solve the puzzles. And if you’re good at the game, then you’ll rack up those coins pretty easily, and you may not even need to use hints. The best thing about Spectrum 6’s hint system is the fact that there are no in-app purchases for more hints, and it is pretty easy to get them back when you use them, if you’re good at the game, anyway. And don’t forget about the stars that you can earn for nabbing the “perfect” solutions — you need a certain amount of stars to unlock later chapters, so always strive for perfects. I just started Spectrum 6, so I’m still in the early levels of the game. But I’m finding them to be rather challenging, and definitely a good way to pass the time when I need to unwind after a long day of Pokémon hunting. Plus, Spectrum 6 looks great with the minimalistic design, the music and sounds are delightful, and the controls are simple enough for anyone to pick-up-and-play. 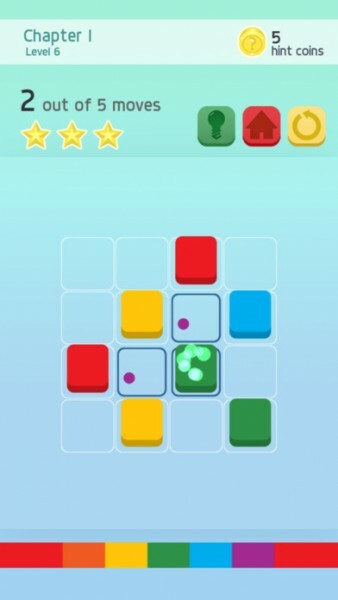 The game can be improved by having the music play during the puzzles, and there should definitely be an undo option, rather than having to restart the entire level from the beginning. Still, the game is solid and a good addition for puzzle fans. I highly recommend giving Spectrum 6 a try if you’re in the mood for a colorful and challenging workout for your brain. 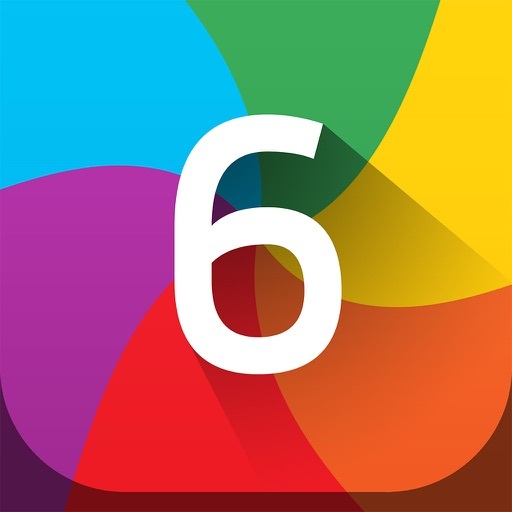 Spectrum 6 is available on the App Store as a universal download for your iPhone and iPad for just $1.99. There are no in-app purchases.